We all know that vegetables are good for us; they can help protect against many chronic diseases, aid weight loss, and provide vitamins and minerals. Yet, even with this knowledge, a good portion of the population don’t eat enough vegetables. I know my family could eat more. Even if you do consume a decent amount of veggies each week, I’d venture to say you could add more; if not more in relation to the amount, then possibly more variety. Variety is important because each vegetable provides different nutrients. It is easy to fall into a rut and eat the same thing every week. Most of us are busy and it can be difficult to find the time to try new recipes or learn to prepare produce we’ve never used before. Finely chopped or shredded vegetables are easily incorporated into many dishes. For added flavor try sauteing them in a little butter or oil before adding. To prepare in ahead: shred (or finely chop) vegetables, divide between small ziplock bags, and store in the freezer (this is a great time to make use of a food processor if you have one). Pull out a bag to add to a meal when needed. 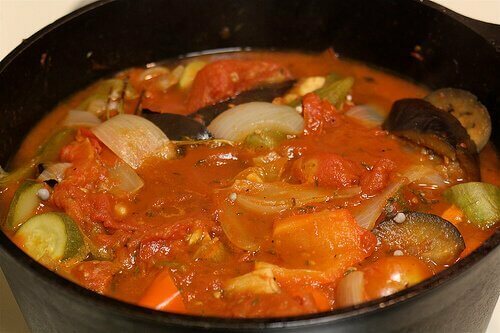 Zucchini, onion, red pepper, and carrots mix well with many family dinners. Also considering sauteing them and adding to sandwiches, burgers, omelets or quiche. It’s taken me a while to get my head around the idea of adding vegetable puree to my meals. Vegetable puree reminds me of baby food! But really, it’s an excellent way to add extra vegetables to meals without anyone even noticing. To prepare ahead: Cook vegetables by steaming, boiling or roasting, allow to cool, then puree in a food processor or blender. Pour into ice cube trays or measure out 1/4 to 1/2 cup portions into freezer bags and freeze. To use: thaw puree and stir into suitable dishes. The best veggies for making puree: cauliflower, carrots, yellow squash, broccoli, zucchini, spinach. Avocados are also great, but they don’t have to be cooked (I’ve seen people sneak avocado into chocolate pudding!). Instead of having plain rice or couscous with a meal, try cooking the grains in vegetable broth, adding a bag of frozen veggies to the water while cooking, or creating a baked side dish like this Broccoli Rice. 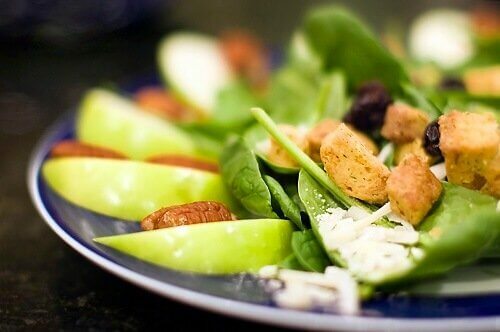 Including salad with one meal a day is an excellent way consume more vegetables. Especially during the spring and summer when fresh produce abounds. To make it easy, prepare a large salad at the beginning of the week (without dressing) and serve it in addition to any other side dishes you usually serve. If the salad is big enough it could last a few days, depending on your family size (and serving size). Once it’s gone, make another one. Two or tree large salads a week should have you covered. If you haven’t tried a green smoothie yet, you should! They are not as scary as they sound. Adding one or two handfuls of spinach to a smoothie of bananas, berries and water, milk or kefir makes a healthy breakfast or snack. The spinach is barely noticeable as the fruit masks it very well. Other greens to consider adding: kale, parsley, lettuce, dandelion greens, and chard. Stephanie has shared some great tips for making green smoothies in this post: Making Healthy Smoothies with Your Fresh Summer Greens. My husband accuses me of adding avocado wherever there’s a gap, and he’s right! It’s so easy to spread on sandwiches, include in Quesadillas, and top salads. Many other vegetables are great fillers, too. Try adding sprouts, mushrooms, beets (pickled or shredded), grated carrot, and mixed greens to sandwiches or salads. Do you have any tricks for adding more vegetables to your meals? Q & A: Healthy freezer meals requested! Great post! My husband also accuses me of adding avocado to everything. On a nightly basis, no matter what I’m cooking for dinner, he mentions his dislike of avocado. It doesn’t matter that you can’t taste it, just knowing that it’s there throws him! I’m always looking out for and buying fresh veggies on sale, chopping them up very fine (usually raw) and freezing them in meal-size portions. I usually pull out at least one bag per meal – I can always find something in my freezer to go with what we are having. I do this too – I always have pureed winter squash and greens in the freezer along with chopped bell peppers. I ususally freeze mine in muffin tins made of silicone – the size is better for my big family. Great tips! Great ideas, Pam! Sounds like there is a lot of veggie eating going on at your house 🙂 Thanks for sharing you ideas! Because I am a vegetarian, there are veggies in everything. But I do sneak the ones they dislike more in by doing all the above. Shhhh! They NEVER know!!! Good post! Love this. I dump tons of veggies in the sauce and hit it with the stickblender. A stick blender is a great idea! I hadn’t thought of that. Loved this! I’ve also discovered “Deceptively Delicious” by Jessica Seinfeld. This book has tons of great recipes for adding vegetable purees into meals! These are great ideas, I’m always looking for more ways to include even more vegetables in my diet. Thanks for sharing! we eat tons of veggies. we get a csa produce box, so it keeps up on top of it! i add greens to smoothies and juicing also helps use up stuff we may not get to. i love a big everything salad for dinner once in a while or have also found that throwing a bunch of veggies into a quiche works nicely. I love your suggestions. Thanks for sharing. I will share this on twitter and fb. We discovered green smoothies about two years ago – great way to get your children to eat their greens. We also juice carrots. I put the pulp from the carrots in banana muffins. We like steamed veggies seasoned and served over rice. That is a great use of carrot pulp! Would love to see the recipe you use are know how much carrot pulp you add. Great post! I look forward to reading more of your writing in the future and i just wanted to say thank you for what you do. I’m always trying to up the nutrient content of our meals, so I add pureed squash to black beans, pureed chick peas go in spaghetti sauce, grated carrots make rice pretty, pureed broccoli stems get added to anything from soups to beans to casseroles, I blend spinach and avocado into our fruit smoothies and add cottage cheese to our sweet potato pancake batter. My husband only finds out if he says he likes it first 🙂 My mom thinks I’m crazy but admits that the food tastes good too. Great ideas! My main way of getting in plenty of veggies is to plan the meal around the veggies. That is, instead of thinking of them as side dishes to a meal starring protein, I start with the veggies and then come up with a protein that will complement them. Kale is good for more than just smoothies! I freeze it shredded in little bags like you mention, and it is great for adding to all kinds of food. Here are lots of ways to use kale. In the “Vegetable Version” category, a big hit with my family is Sweet Potato Burritos. They can be made with well-drained squash puree instead of sweet potato. Thanks for such an informative article, it’s been very useful. Great suggestions! I already put shredded carrots in my meatloaf. I’ll have to try using purées in dishes as well! Just a thought, My mom always used to make homemade spaghetti sauce and instead of adding sugar like most recipes called for, she would shred a carrot in the pot instead, as it is a natural sweetener. You could never tell the difference, except that it was good!!! Thanks for sharing all this info. It is really helping me. I know avocados are wonderfully nutritious, and my hubs & I love them, but our son won’t touch them with a 10 foot pole. He’s weird about textures…so sneaking them into the pudding won’t work either (he doesn’t eat ice cream, pudding, jello, smoothies, milk shakes, apple sauce, etc). But using them in place of or in addition to mayo/mustard on a sandwich might just work. I’m also starting to make more smoothies for myself. He did try a small sip and still doesn’t like it. But I thought I might start putting a ounce in his chocolate milk and very gradually increasing the amount of smoothie and decreasing the chocolate milk and see if I can get him used to taste and texture.